Spanning 6.7 million km2 (twice the size of India) the Amazon Biome is virtually unrivalled in scale, complexity and opportunity, and truly is a region distinguished by superlatives. Not only does the Amazon encompass the single largest remaining tropical rainforest in the world, it also houses at least 10% of the world’s known biodiversity, including endemic and endangered flora and fauna, and its river accounts for 15-16% of the world’s total river discharge into the oceans. 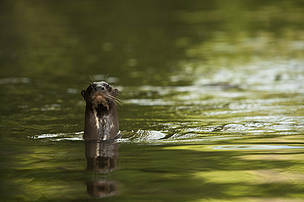 The Amazon River flows for more than 6,600 km, and with its hundreds of tributaries and streams contains the largest number of freshwater fish species in the world. Equally impressive are the unfathomable numbers of mammals, birds, amphibians, and reptiles4 found across the biome. The Amazon is home to more than 30 million people living across a vast region subdivided into nine different national political systems. According to the Coordinator of Indigenous Organizations of the Amazon Basin (COICA), about 9% (2.7 million) of the Amazon’s population is still made up of indigenous people – 350 different ethnic groups, more than 60 of which still remain largely isolated. And yet, for all of its magnitude and apparent remoteness, the Amazon Biome is surprisingly fragile and close to each one of us. During the last half century, the seemingly endless Amazon has lost at least 17% of its forest cover, its connectivity has been increasingly disrupted, and numerous endemic species have been subjected to waves of resource exploitation. The economic transformation of the Amazon based on the conversion and degradation of its natural habitat is gaining momentum. Yet, as those forces grow in strength, we are also finding that the Amazon plays a critical role in maintaining climate function regionally and globally, a contribution which everyone–rich or poor–depends on. The Amazon’s canopy cover helps regulate temperature and humidity, and is intricately linked to regional climate patterns through hydrological cycles that depend on the forests. Given the enormous amount of carbon stored in the forests of the Amazon, there is tremendous potential to alter global climate if not properly stewarded. The Amazon contains 90-140 billion metric tons of carbon, the release of even a portion of which would accelerate global warming significantly. Currently, land conversion and deforestation in the Amazon release up to 0.5 billion metric tons of carbon per year, not including emissions from forest fires, thus rendering the Amazon an important factor in regulating global climate (Nepstad et al 2008). Between 1999 and 2009, 1200 species of plants and vertebrates were identified for the first time. 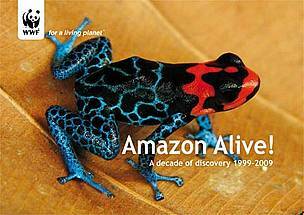 Ranging from a coin sized pnk rigned frog to a 4 meter long anaconda, the findings confirm the Amazon as one the most biodiverse places on Earth. 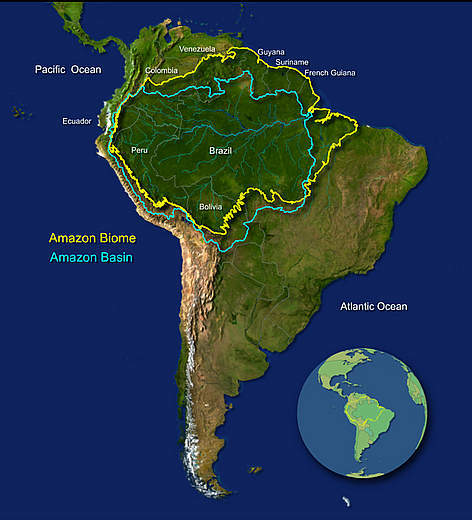 The Amazon Biome, is defined as the area covered predominantly by dense moist tropical forest, with relatively small inclusions of several other types of vegetation such as savannas, floodplain forests, grasslands, swamps, bamboos, and palm forests. The biome encompasses 6.7 million km2 and is shared by eight countries (Brazil, Bolivia, Peru, Ecuador, Colombia, Venezuela, Guyana and Suriname), as well as the overseas territory of French Guiana. 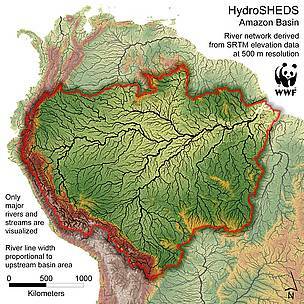 The complete watersheds expand beyond the biome and sometimes include adjacent biomes (dry forest, cerrado and puna). Millions of years ago, the Amazon River once flowed from east to west, emptying into the Pacific Ocean. When the Andes Mountains began to rise (due to great pressure on the tectonic plates) along the eastern side of the South American continent about 20 million years ago6, this emerging mass blocked the flow of the Amazon River. Every year, the Amazon rainforest receives torrential rainfall - between 1,500 mm and 3,000 mm.9 Where does all that water come from? If evapotranspiration and its role in maintaining ecological balance is disrupted, the climate throughout region - and well beyond - will be significantly impacted. HydroSHED of the Amazon - high-resolution elevation data used to create a global hydrological database. Click to enlarge. As our knowledge of the Amazon constantly increases, so does our understanding of the major ecological services rainforests offer to the local and global community. While many equate a patch of rainforest with quick rewards - some simply to put food on the table - others see it as a repository of biodiversity, useful chemical compounds or even carbon stocks for the world’s increasing carbon dioxide emissions. The Amazon wildliife, people and rainforests function along with the rhythm of the seasons. However, with the Amazon River Basin under siege from fire and the destructive interventions of humans, this natural system is being reduced to cinder and ash in too many places. Find out more about what WWF is doing to save the Amazon. 10 US Geological Survey. Glossary. http://biology.usgs.gov/s+t/SNT/noframe/zy198.htm. Accessed 10/10/05.